There’s no place like Anteprima, Andersonville’s beloved den of fresh pasta and la dolce vita. Oh, wait. Yes there is. 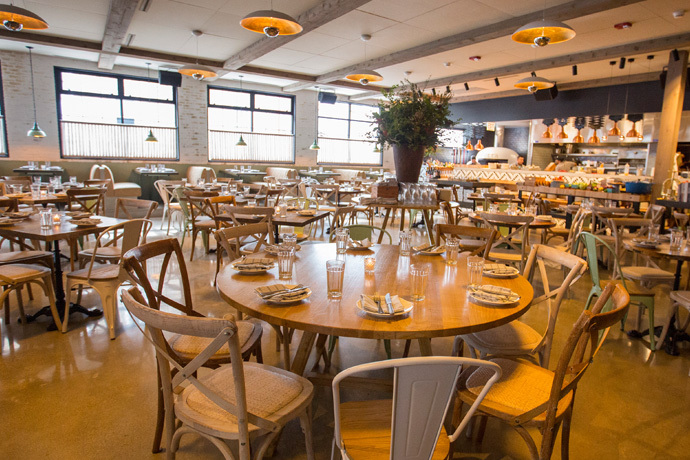 Meet Azzurra EnoTavola, Anteprima’s Wicker Park–based, pasta-and-wine-laden cousin, opening tomorrow. You know all about the hospitality of Anteprima. Well, expect the same kind of treatment here. You’ll be ushered into a room that has the feel of some Italian grandmother’s cottage: pastoral landscapes hanging on the walls, 10 Victrola horns dangling from the ceiling, the smell of pancetta-wrapped pork loin inviting you to sit down and get comfortable. And you can never refuse pork. Or Italian grandmothers. So you’ll sit. You’ll settle in. If you’re here on a date, a bottle of Chianti is a logical first move. Then do what comes naturally. Order some olives. Or some crispy brussels sprouts. Or a board of various cured meats. Or... basically, you can make a meal out of the appetizers here. Though a big bowl of spaghetti carbonara or grilled boar sausage isn’t a bad play either. Cap it all off with a shot of limoncello. It’s how they do it in Andersonville.